Everyone who knows me knows how I love to eat. I actually love to cook even more than I like to eat. Having learned from both my parents, cooking with a ballgame and music in the background, Taylor staring from his bed, is my happy place. While I love Thai, Cajun & Creole, Italian, now Burmese, Chinese, and good ol’ American cooking, my first love continues to be my best love: Indian food and Indian cooking. And within the massive subcontinent, there is a multitude of cuisines. I follow this blog, whose focus is Goan cooking and Goan culture. I love the Goan recipes found in it! I love cooking rice. This particular blogpost highlights many of the different ways to cook rice pulao. It’s so amazingly tasty. Enjoy! Rice cooked in a seasoned broth can be called many names. It only depends which part of the world you come from. You can call it Pulao, pilaf, pilav, pilau, palaw, plov, polo, polu and polov. Goan Pulao Rice is also called as Arroz de Refogado and in my case Mama Arroz. The basic recipe is made with cloves, cinnamon stick, dried cinnamon leaf, onions, tomatoes, pinch of turmeric and bouillon/maggi cube for flavor. 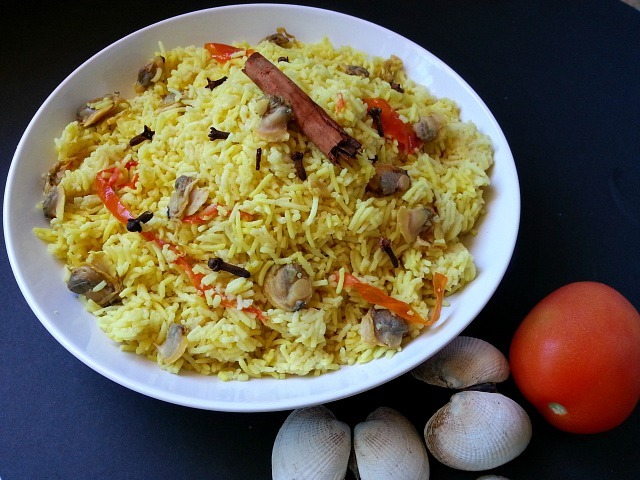 This recipe can be used as a basic base for all the other Goan Pulao Recipes. Like clams/tissreo pulao, vegetable pulao, prawn pulao and the famous Goan pork sausages pulao.